Provide comfort for the family of Mary Essman with a meaningful gesture of sympathy. Mary Dorothea Michel Essman joined her loved ones in heaven on Friday February 1, 2019. Her prayers were finally answered and she now is in the presence of her loving Savior. Mary was the youngest daughter of the Volga Deutsch family of Cornelius and Theresa (Lehman) Michel, who relocated from Susennantal Russia to the Yellowstone Valley to raise sugar beets and keep their freedom. Her childhood stories revolved around the entire family working to hoe the beets in the field and craft handmade gifts for Christmas. Born on November 13, 1925, she started school in Lockwood at the age of four, not speaking any English, and graduated Billings High School in 1942. Due to the love of her sisters who worked to pay her tuition, she was the first in her family to attend college, graduating from Eastern Montana College with a two year teaching certificate. She taught first grade in Belfry, Laurel, and at Garfield school in Billings. Mary met her husband, Vern Essman, while they were both singing in the choir at Trinity Lutheran Church, the church of her baptism and confirmation. Mary and Vern were married in Victorville, California in September 1950 before Vern was shipped out to the Korean War. Vern and Mary started a One Hour Martinizing drycleaning business in 1956 which they grew and operated for many years. Her children remember the sound of her adding up the daily receipts on a ten key late into the night after they had gone to bed. Mom loved music and played the organ for the German Service at Trinity for many years. She would play beautiful music from memory on the piano at The Springs at Grand Park even after she had lost much of her sight, hearing, and memory. Mom loved to teach and raised a family of teachers. She volunteered in the classrooms at Trinity Lutheran School as long as she could, donating many hours to help children with their reading. Mom loved her flower garden, especially her roses. She also made the best raisin spice cake covered with a maple frosting. Mary was preceded in death by her husband Vern and her sisters Lydia, Emma, Elizabeth, Hannah, Rose and Minnie, and by her brothers William, Henry, Herman, John and Richard. The old Germans are now all gone. She is survived by her five children, all of whom she was proud to have graduated from college, Jeff (Sherry), Lynne Erger (Patrick), Suzann Cox (Warren), Brenda, and Joan Wiegert (Neal) as well as eight grandchildren and one great granddaughter. 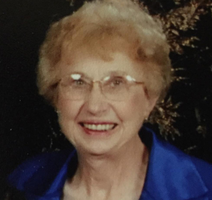 Her life will be celebrated and the Lord will be praised at her funeral service at Trinity Lutheran Church at 11:00 am on Wednesday, February 6, 2019. Memorials may be made to Trinity Lutheran School which was dear to her heart. To plant a memorial tree in honor of Mary Dorthea Essman (Michel), please visit our Heartfelt Sympathies Store.